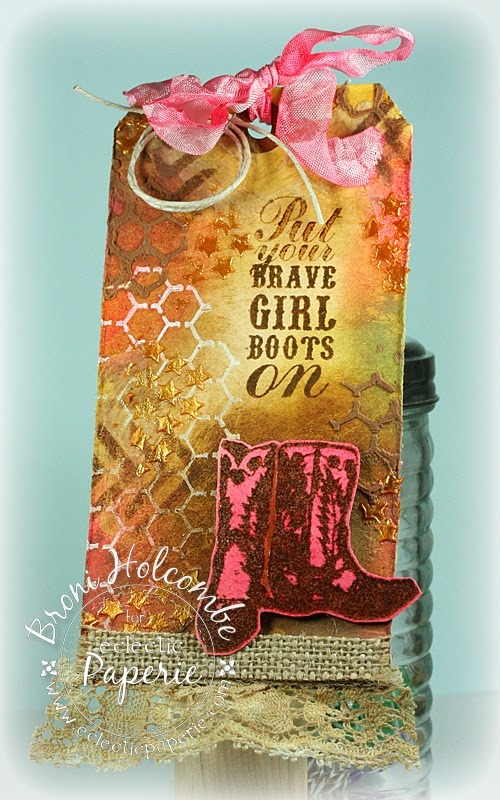 Eclectic Paperie: Put Your Brave Girl Boots On! Hey there, everyone! 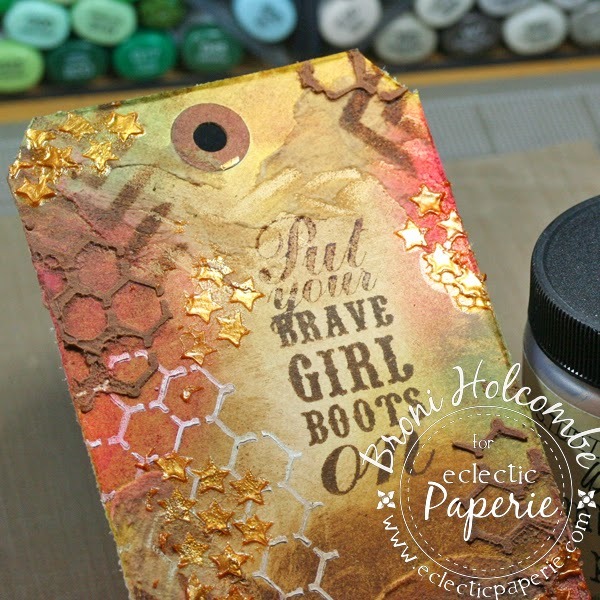 It's Broni here and I've got a fun tag to show you that I made using some Unity stamps, some TCW stencils and some Studio 490 embossing pastes. I think I've always been a cowgirl at heart, and I firmly believe you can be one and still be a girly girl. So pink boots are in order, right? 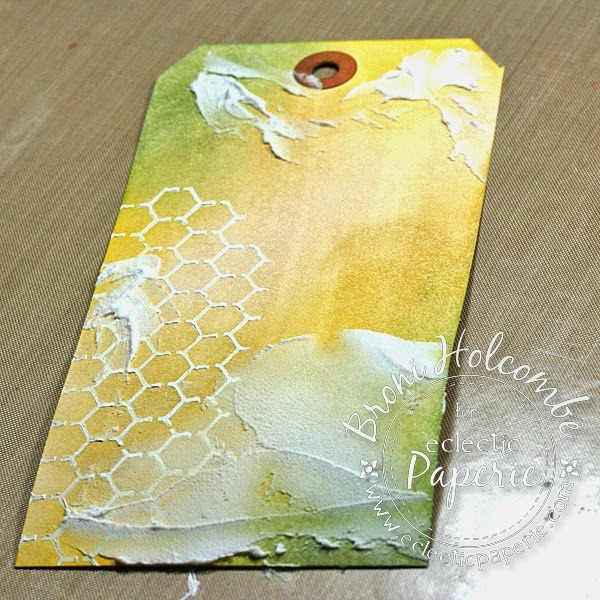 I painted some Gesso onto the tag using the Mini Chicken Wire Reverse stencil. I covered the entire tag with Antique Linen Distress Stain. The gesso resists the stain and still shows up white. 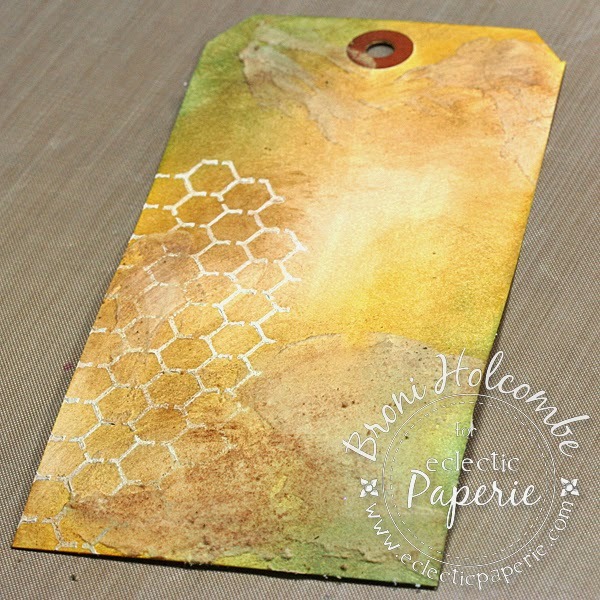 I also sponged on some Squeezed Lemonade, Bundled Sage, and Old Paper Distress inks. 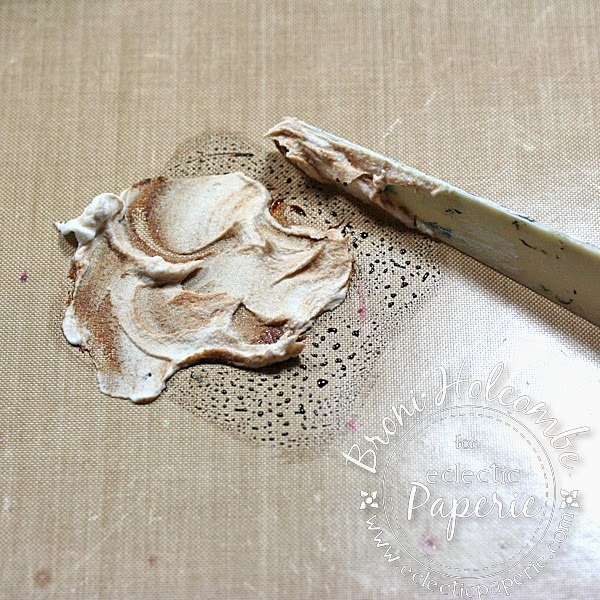 Then I spread on some white embossing paste in random spots. Next I added more stain over the top of everything to blend it all together. 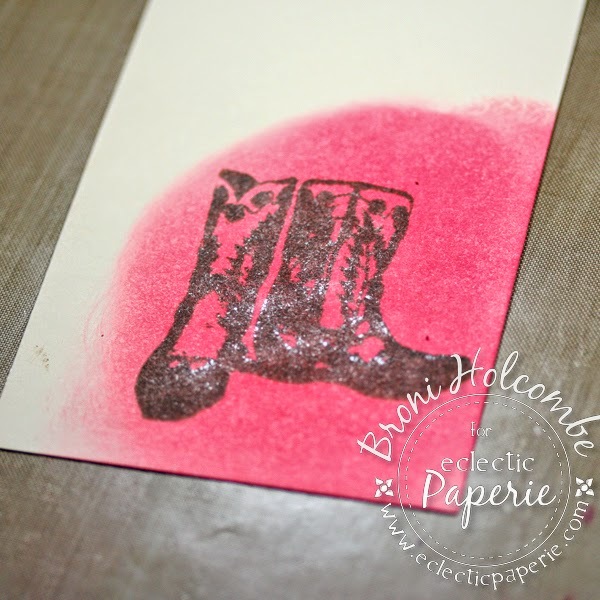 I took another tag and sponged on some Worn Lipstick ink then stamped my cowgirl boots on top in Gathered Twigs ink. You can see that the ink is still a little wet in this photo. 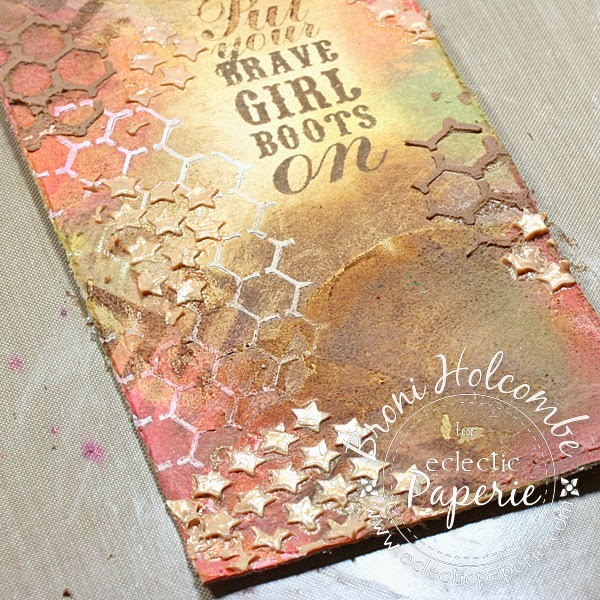 I sprinkled on some clear embossing powder and blasted it with my Heat tool. 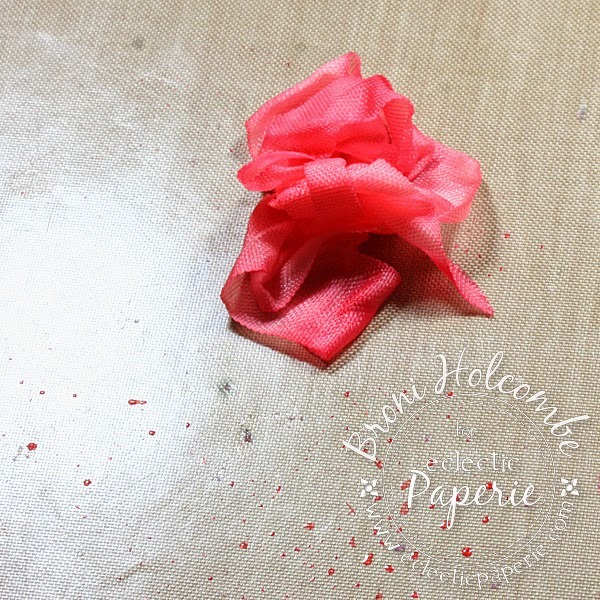 I wanted some ribbon to match, so I smooshed some more Worn Lipstick ink onto my craft sheet and misted it with water, then dragged the seam binding through it until it was totally colored. I left it bunched up to dry on my craft sheet, but you could also blast it with the heat tool. I sponged some more of the Gathered Twigs ink onto the tag using my Mini Chevron stencil and stamped my sentiment too. Then I felt that I needed some more pink in the design, so I sponged some onto the tag around the edges. Next I smooshed some Gathered Twigs ink onto my craft sheet, misted it with just a little bit of water, then mixed in some white embossing paste. I applied it to the tag through my Chicken Wire stencil. 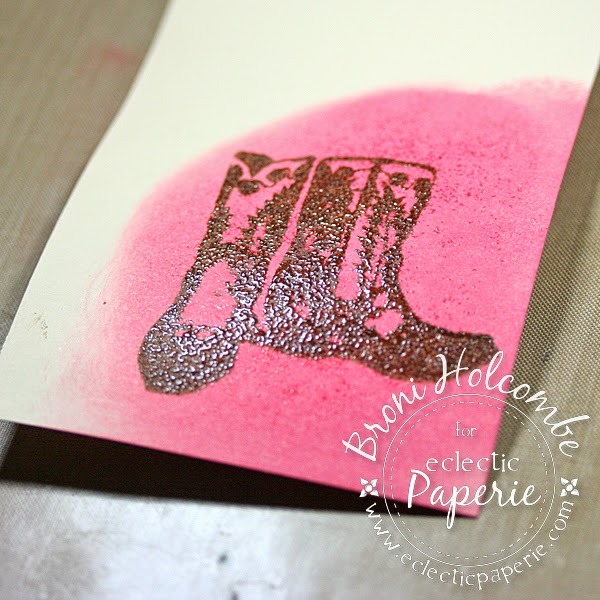 I also applied some Metallic Gold embossing paste using my Mini Punchinella stencil. I love that stuff so much! Love the brilliant shine you get and the texture when applying it. I think if it smelled like fruit I might try to eat it. Yes, I love it that much! To finish up, I distressed all the edges with my Tonic scissors, added lace that I colored with my Antique Linen Distress stain and a strip of burlap using some Scor-tape. I also attached a coil of hemp twine using my Mini Attacher and tied on my pink seam binding. The boots were cut out and popped up on foam mounting tape. Here's the tag again and also another view of the tag hanging up. I hope you like it and that you enjoyed hearing about the process. Let me know if you have any questions! I love your pink cowgirl boots. :) Fab tag Broni! I am in LOVE with this cowgirl tag Broni! LOVE the layers and the gold stars! And those boots and the lace are FAB details! Herrlich ist das Tag geworden, danke auch für die Anleitung. 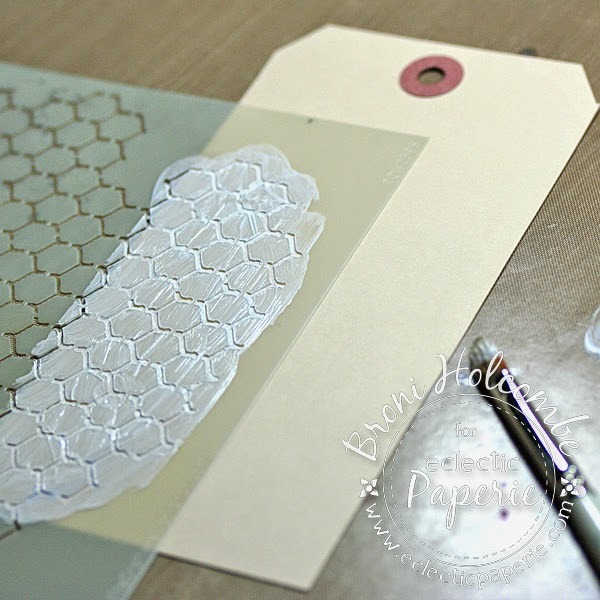 Great tag, I like all the texture...thanks for showing the step by step process. Thank you all so much, ladies! I really had fun with this tag! What a wonderful tag Broni! 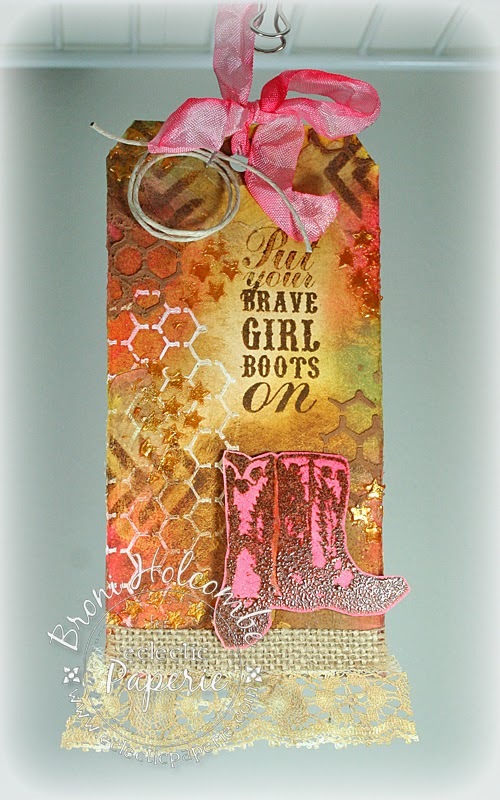 Love the colors, stencils and texture you created for your background and the frilly touches with the pink boots and lace! Broni your tag is just gorgeous !! Love the texture and like you adding a bit of gold shimmer makes a difference... And those boots... Oh they are so cute !!! Thanks a lot for sharing.... Also for the step-by-step info..
Gorgeous colors and lovely layers. This is a fantastic tag dah-ling!